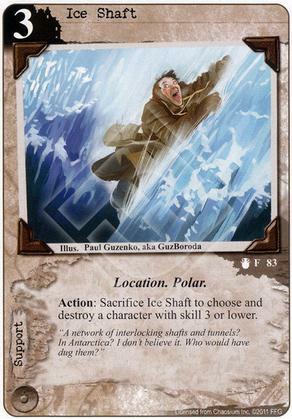 Flavor Text: "A network of interlocking shafts and tunnels? In Antartica? I don't believe it. Who would have dug them?" I'm really surprised, that after sewer rats FFG made another neutral removal card - and one that destroys. Better a card with options to destroy being Neutral than in the same factions (Mythos). That give no option to be really competitive to Investigators, imho. This is nowhere near this powerfull and can be completely negated with support removals. Still is a really nice card and gives human fractions a way to deal with all this invoulnerable and high toughness things, especially as it can target ancient ones and syndicate can lower skill quite nicely.